Tanzanian Model's Big Reveal - Will Baby Look Like Diamond? 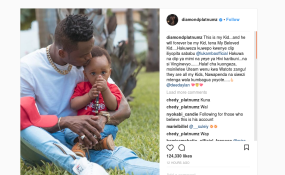 Tanzanian musician Diamond Platnumz has told off doubters who claim he is not the real father of model Hamissa Mobetto's son. Diamond fired an angry post on Instagram to confirm that one-year-old Daylan is indeed his son whom he loves very much. It all started when the singer posted a short clip of himself promoting his forthcoming tour across United States. The short video captures Diamond talking about his career and family. He says how he will be away for almost a month from his family and not being able to see his mother, sisters and children. The video however only captures his two children he bore with Ugandan born socialite Zari Hassan. It left out the love child he bore with Hamissa Mobetto. Fans expressed varied reactions forcing Diamond to come out and defend himself. Diamond is rumoured to have recently bought a posh mansion for Hamissa Mobetto at a prime location in Dar es Salaam.